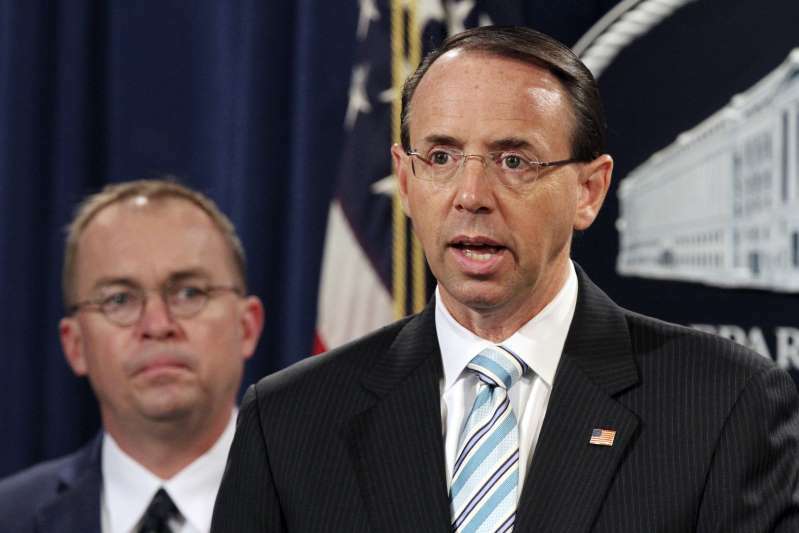 Rod Rosenstein,Mick MulvaneyDeputy Attorney General Rod Rosenstein speaks at a July 2018 news conference at the Department of Justice in Washington. Congressman Mark Meadows, joined by a handful of fellow Republicans, filed a resolution on July 25 to impeach Deputy Attorney General Rod Rosenstein. While their gambit is largely a public relations stunt, it could end up having real-world consequences for future impeachment attempts by the House of Representatives. First, the resolution lowers the bar in defining what are "high crimes and misdemeanors" — the ambiguous standard for an impeachable offense. Second, it reduces the threshold necessary for the House to commence impeachment proceedings in the first place. Meadows lists five articles as the basis for Rosenstein's impeachment. Two charge an alleged conflict of interest principally based on the theory that Rosensetein is a potential witness in the Russia probe. The other three articles stem from the Department of Justice's response to subpoenas issued by two House committees seeking sensitive evidence gathered by prosecutors working for special counsel Robert Mueller. [post_ads]Meadows and company argue that the refusal of the executive branch to produce every document subpoenaed by Congress is grounds for impeachment. This is a theory that by Republican members of Congress rejected when Richard Nixon refused to turn White House tapes and documents over to the Judiciary Committee in 1974. Nixon's failure to produce these tapes served in July 1974 as the basis for impeachment Article III, adopted in a 21-17 vote by the House Judiciary Committee. Only two of 17 Republican committee members voted in favor of that article. Yet the Constitutional justification for Article III was much stronger than the basis for Meadows' resolution is today. Article I, Section 2 of the Constitution grants the House the "sole power of impeachment"
Along a near-party line vote, the committee's final report in 1974 concluded that Nixon's withholding of White House tapes impeded Congress's exercise of its impeachment powers. But Meadows' complaint relates to Rosenstein's refusal to turn over evidence gathered by the Mueller probe. And the House has no mandate to supervise the potential criminal prosecutions supervised by Rosenstein. Rosenstein, if the full House concurred, could be held in contempt of Congress to compel further document production. But importantly, it has long been understood that a president cannot be held in similar contempt. The Supreme Court ruled in U.S. v. Nixon that contempt power of the courts does not apply to sitting presidents "given the unique circumstances," as it would be "unseemly." According to the 1974 Judiciary Committee final report, this means that essentially the only way to stop a president who is obstructing a Congressional investigation is to impeach him. Republican members in 1974 adamantly disagreed with the rationale of Article III. The ranking Republican on the committee, Edward Hutchinson, wrote in his addendum to the committee's final report: "The idea that a President should be removed from office because he does not comply with a subpoena of a committee of the House, even if the precedent be limited to impeachment cases, is frightening." Yet Meadows' resolution could potentially make that "frightening" scenario a reality by lowering the standards of justification. His argument hinges on the theory that failing to give Congress every document sought in any type of proceeding is grounds for removal from office. Meadows' resolution also degrades the standard necessary for the House to initiate an impeachment proceeding. Some respected commentators have argued that the House should never initiate impeachment proceedings unless there is a likelihood that the Senate will convict following a trial on the merits. This thinking parallels the notion that a prosecutor should not seek a criminal indictment unless there is a reasonable prospect of a conviction at trial. But Meadows endorses a far more relaxed standard, as his resolution has almost zero chance of leading to the Senate's removal of Rosenstein. To remove Rosenstein from office, 67 senators would have to vote to convict him. With only 51 Republicans in the Senate, there is no possibility that Rosenstein would be removed by the Senate. As a result, Republicans' call to impeach Rosenstein undermines the proposition that the party in power must refrain from starting an impeachment inquiry if the prospect of a Senate conviction is nil. So what does all of this mean? Rosenstein is almost certainly going to keep his job. But the existence of this new impeachment solution could make future impeachment proceedings easier to start — and maybe even easier to prove.